For all of the talk this offseason of what the Denver Broncos need to do to get back to form, it could all come down to the production of one single man. No, it isn’t Von Miller, who has proven to be one of the top performers in the game today. Miller turned in the most complete season of his career in 2016, making 78 total tackles, while still getting 13.5 sacks. He should be at the top of his game once again in 2017. It isn’t even first round draft choice Garett Bolles, who will take some time to develop at left tackle. Despite all of the interest that the quarterback situation is getting, the Broncos season will not be completely dependent upon the play of Denver’s young quarterbacks. 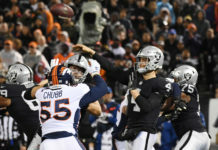 Trevor Siemian earned the starting job last season, and his experience and poise should help him in the battle again this time around. Second-year passer Paxton Lynch has a cannon for an arm, and is hoping to unseat Siemian and prove that he is worthy of taking the reins. Yet, we have seen that if you surround a quarterback with enough talent, an NFL team can still find ways to earn some difficult wins. No, the Denver Broncos success in 2017 could come down to one man, and he is a man that will not set a foot on the playing field come game time. 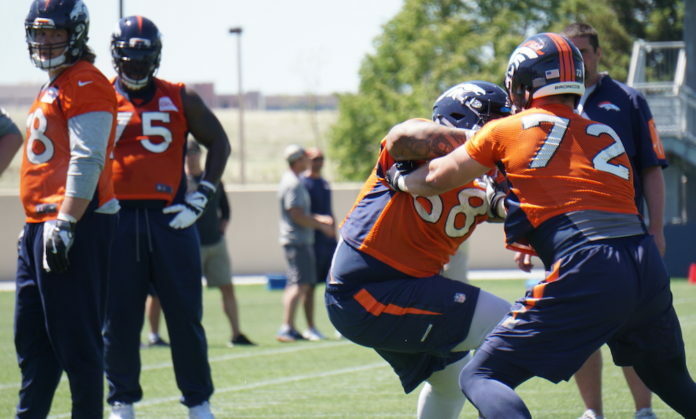 The Broncos’ new offensive line coach Jeff Davidson has himself quite the remodeling project, and his ability to make substantial improvements, could make or break the season. The Broncos’ offensive line has been a work in progress for the past three seasons, and it seems to be declining. The offensive front benefitted greatly from Peyton Manning’s ability to read the defense and get the ball out of his hands very quickly. As his physical skills began to deteriorate, it became apparent that the unit was not capable of raising their level of play. In 2013, the Broncos rushed for over 1,800 yards and allowed just 20 quarterback sacks. They maintained that performance in 2014, rushing for 1,785 yards and allowing Manning to be sacked just 17 times. Then, head coach John Fox, and offensive coordinator Adam Gase were relieved of their duties. 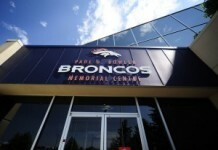 New head coach Gary Kubiak and offensive coordinator Rick Dennison took over, and Clancy Barone took over as the director of the offensive line. The change seemed to clash with the comfort level of Manning, and the offensive line began to show some consequential flaws. During the 2015 season, the Broncos still managed to rush for over 1,700 yards, but Manning and backup Brock Osweiler were sacked 39 times. The Denver offense sputtered for most of the season, but somehow the defense played at an all-time level, and the Broncos won Super Bowl 50. Last season, the Broncos sunk to a new low in the offensive trenches. With Evan Mathis, Ryan Harris and Louis Vasquez departing, Donald Stephenson and Russell Okung were signed. The results were not good. The Broncos rushed for just 3.6 yards per carry, and Broncos quarterbacks were sacked 40 times. Trevor Siemain and Paxton Lynch were under constant duress, and the Broncos offense ranked among the league’s worst. 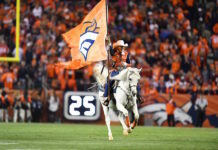 The Broncos missed the playoffs for the first time since 2010, and head into the upcoming season with much uncertainty about where they are capable of going. It’s easy to say that Stephenson and Okung were monumental misses by John Elway and the Broncos front office. However, we began seeing this problem emerge prior to those free agent signings. We haven’t exactly seen a ton of development within this unit, and that is where Jeff Davidson can make himself very valuable. Davidson played for the Broncos for four seasons from 1990-1993, before finishing out his career with the Minnesota Vikings. As a coach, he has had stops in New Orleans, New England, Cleveland, Carolina, and Minnesota. Most recently he was in charge of the offensive line for the then San Diego Chargers. Last season, the Chargers went just 5-11, but they did rush for 1,500 yards and scored nearly 26 points per game. Davidson has overseen productive runners like Adrian Peterson, Jonathan Stewart, and Melvin Gordon. The Broncos are not without talent. Matt Paradis is one of the top centers in the league. Max Garcia is showing signs that he can be a successful guard, if he can develop some consistency. Menelik Watson, Ronald Leary, Ty Sambrailo, Michael Schofield, Stephenson and rookie Bolles must all show significant growth under Davidson. The Denver backfield is as deep as it has been in recent years. C.J. Anderson, Devontae Booker, Jamaal Charles, Bernard Pierce and De’Angleo Henderson will all be pushing for playing time. If the Broncos offensive line can grow and improve, then this offense will no longer have to be an anchor around the neck of the team. A successful running game would take the pressure off both the Broncos young quarterbacks, and a defense that is forced to play far too many snaps. Jeff Davidson has to do a better job of growing this offensive front than the previous regime. He has a chance to completely change the look of the 2017 Denver Broncos.